With things post storm back to normal I took a look at one of the more “modern” mother boards I have. I was given this board quite some time ago, and it looks like it hasn’t been used. I think it was probably new old-stock as it was quite out of date by the time I got it. I’ve kept it as a spare as my Dad is still using a P4 based machine, and I’m currently using a P4 based system for my server. It’s an Aopen mx46-533gn which supports a socket 478 processor with FSB up to 533Mhz. This board is so far un-tested as I have not had any need for it yet and it isn’t really a great performer as we will see. The highest CPU officially supported is a Northwood P4 @2.8Ghz with 533Mhz FSB, but the board only supports 333Mhz DDR RAM. So it’s fairly likely that the CPU would end up waiting for the system memory quite a bit. Additionally it has an 651 SIS North bridge and 962L SIS South bridge. 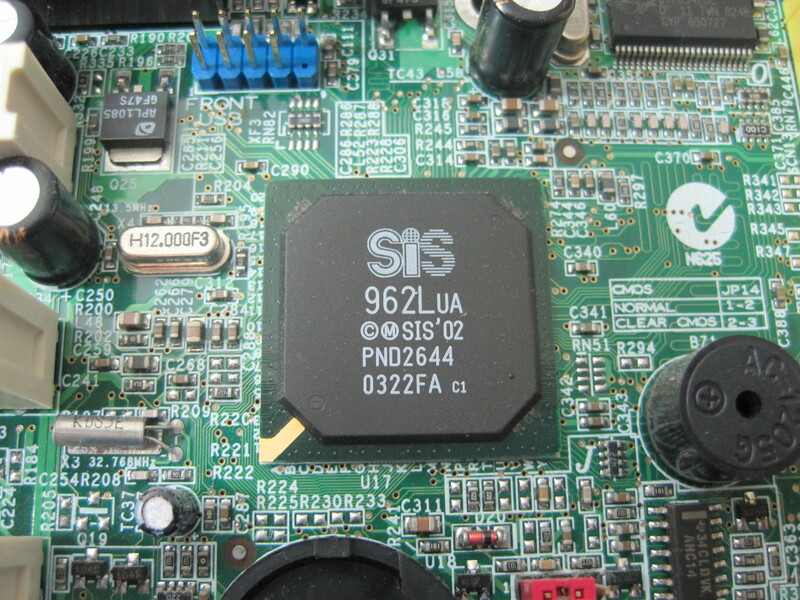 SIS were never known for making high performance parts, although boards that used their chipsets were frequently significantly cheaper. 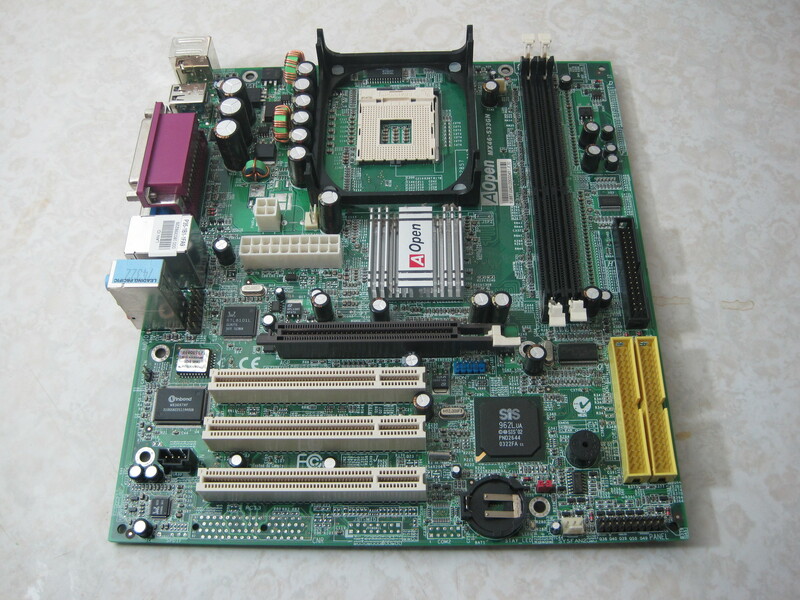 I remember replacing a SIS based board in my brothers machine with an N-Force 2 based board and we got a significant improvement in performance, but other value chipset makers such as VIA also usually had better performing parts. So this is clearly a commodity consumer board, designed to be cheap and cheerful. It has on-board video like most commodity boards, but being SIS graphics it doesn’t compare favourably. There is at least an AGP 4x slot, so you’re not stuck with it. The on-board LAN and audio are the usual Realtek devices of the time. A Winbond Super IO chip provides legacy ports such as serial, parallel and PS/2 ports for mouse and keyboard. Some of you may have noticed that some boards such as this will produce low levels of digital like noise with their on board sound. Looking at this board I wouldn’t be surprised if it produces such a noise. The reason is mostly the layout of the board. The nearest chip to the Audio output is the Realtek LAN chip, and not far from that is the ROM and Winbond Super IO. 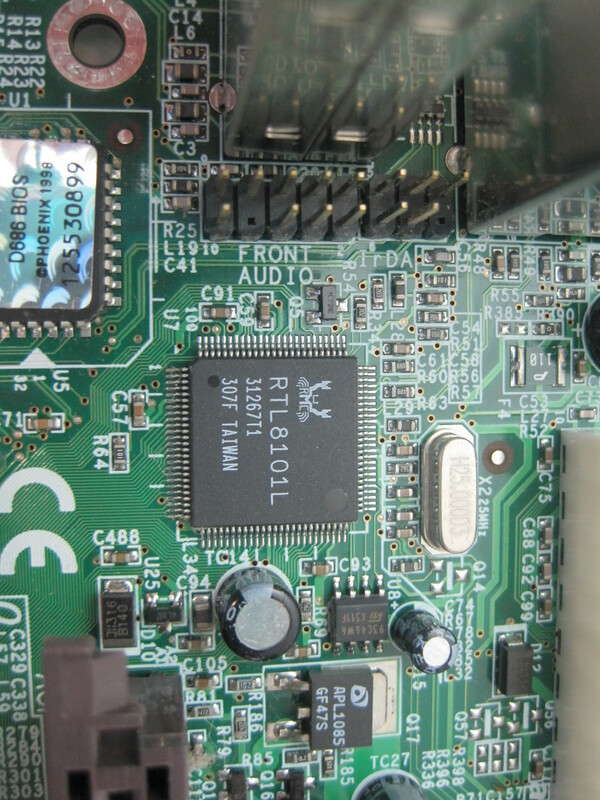 The audio chip is the one at the bottom left of the board. This means the audio output traces have to go past a number of high speed digital lines, which due to cross talk are the likely reason for any noise. Working on or installing this board isn’t as easy as it could be. Whilst there is no need to set the CPU speed with jumpers, other headers such as the front panel and audio are not labeled or labeled poorly. This makes it pretty much mandatory to refer to the manual or easy installation guide. For then end user it was probably fine, as long as you weren’t after performance. Boards like this one sold in large numbers to people who just wanted a basic computer for a bit of web surfing, email, and maybe some solitaire, and for that it would have been fine. I can’t comment on reliability as I haven’t used one in service, and we didn’t sell these where I worked. 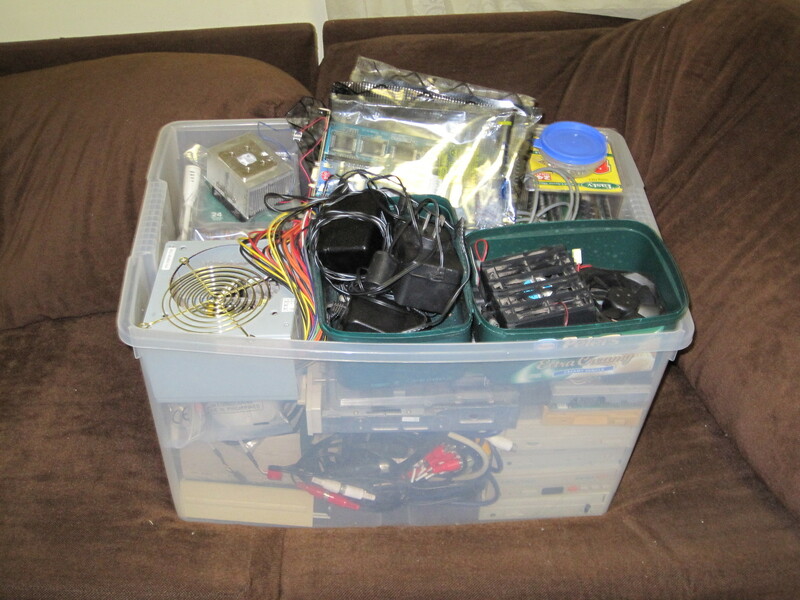 It’s not everyday that someone moves house, and when someone I know moved house recently they found a pile of old computer gear they didn’t want anymore. They asked me if I wanted any of it and of course I said yes! So last weekend I got this rather large box of old computer gear. I just had enough time this weekend to unpack it and take some photos. This weekend I was having a tidy up, between doing more domestic style cleaning I got out another one of my storage boxes to document its contents. I’ve done this twice before, once here at my place and once at my parents place. You can find the posts here and here. This time around I found less older hardware and some more modern stuff, in particular a cache of AGP graphics cards of various types. A couple of weeks ago I got all my hard disks out and took photos of them. This made me wonder if any of the disks still worked and what was on them. I keep all my PC expansion cards stored in some storage tubs inside static bags with some desiccant packs to keep them dry, which means I would have to have a look in them to search for a SCSI card to test the drives with. I figured why not take some photos of the cards whilst I am at it. Firstly I have here a picture of two very useful things every computer technician should have around. A can of isopropyl alcohol in spray form for cleaning slots of various types, you could use contact cleaner as well, but that leaves a residue sometimes. The box is full of isopropyl infused medical wipes which are good for general cleaning and can be used to clean card edges and the like. Very useful for cleaning thermal paste up if you ever need to, they are less messy than other methods. Not pictured but also useful is a tooth brush (not used for teeth anymore!) and cotton buds to aid in the cleaning process.